We’d love your help. 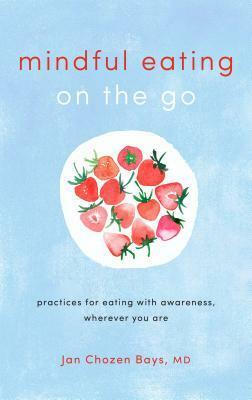 Let us know what’s wrong with this preview of Mindful Eating on the Go by Jan Chozen Bays. To ask other readers questions about Mindful Eating on the Go, please sign up. Def not a book for someone with an eating disorder (not like I have one, but just saying), but a book for very focused mindful eating wherever you are. Another Highly insightful book on mindful eating by one of my favorite authors on mindfulness. I will purchase this one when it comes out and carry it with me in my purse to look at as I go about my daily work and errands. I especially loved reading and learning about the many different aspects of hunger… I had never really thought of this before and it is making a difference on my Journey. Thank you to NetGalley, the author and publisher for an advanced reading copy of this book in exchange for Another Highly insightful book on mindful eating by one of my favorite authors on mindfulness. I will purchase this one when it comes out and carry it with me in my purse to look at as I go about my daily work and errands. I especially loved reading and learning about the many different aspects of hunger… I had never really thought of this before and it is making a difference on my Journey.